When choosing a theatre to go to, many of us, especially those who do not have kids, might wish to skip the announcements of a children's theatre just misguided by the target audience name. Whatever it is, it would be wrong for the Music and Drama Children's Theatre «А-Ya» (analogue of A to Z) as this is a theatre for the whole family. The company has been working for 25 years by now, having developed from an experimental studio into a professional theatre. Those who went to this theatre twenty years ago as children, now come to the shows with their own kids. The A- Ya Theatre is located in the centre of Moscow. It takes 10-minute walk to reach it from the Chekhovskaya metro station. The repertoire offers the performances for all children from the age of 3 as well as for adults who are welcome with their teenage kids or independently. The family-friendly productions feature music, drama and dance as a means of introducing children to the magic of performing arts, educating and cultivating love for reading, engaging into a dialogue between the generations. The program includes classical plays, both national and foreign, staged fairy-tales of the world (Europe, Africa, Asia), art experimental projects and other kinds. Before the performance there are always some actors who welcome the guests in the lobby. Children are offered to draw and to play. The auditorium isn't big, and the seating is free. Little kids are usually seated in front. The stage is so breathtakingly close that it's impossible to stay out of the action. The audience gets instantly involved and enthralled. 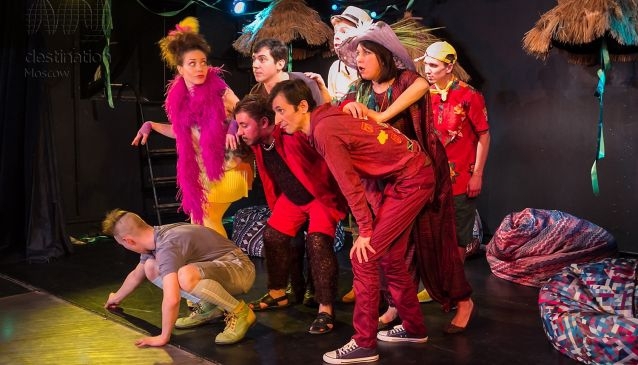 The A - Ya Theatre company successfully tours around Russia and in Europe. Its best productions and projects are participants of the festivals 'Gavroche', 'The Big Break' and other. The theatre is the organizer of the annual festival of children's performances 'The Miracle is Close'. For a quarter of a century the 'A-Ya' Theatre has been promoting and developing its own concept based on the individual, caring and serious communication with the young audience.